Your search is over for the top-notch island you can ever be in the Philippines – that is no other than Mactan Island in Cebu! Name it; they have it – awesome water sports like scuba diving, parasailing, jet skiing, appetizing seafood, and yes, even masterful guitars! #1 - Shangri-La’s Mactan Resort & Spa: Once you set foot in Shangri-La’s Mactan Resort & Spa, located at Punta Engano Road, Lapu Lapu --you’ll have one thousand and one reasons not to want to leave! How come? Hear this: luscious breakfast buffet waiting for you at Tides Restaurant, sensational snorkeling at their Marine Sanctuary, the opportunity to taste heavenly ripe mangoes as you explore Mactan, world-class rooms to relax in, complete with modern amenities, the finest seafood dishes at Cowrie Cove, so flavorsome your mouth will water, etc. Just you take one look, you’ll never want anything more than the best Shangri-La’s Mactan Resort & Spa has to offer! #2 - Crimson Resort and Spa, Mactan: Rapturous times are ahead once you enter into Crimson Resort and Spa, Mactan – situated at Seascapes Resort Town, Mactan Island, Lapu Lapu. You and your company will be swept away with this exquisite resort’s multiple facilities (infinity pool/private beach/spa etc), amenities (soft beds/Wi-Fi/plunge pool/etc), services (fitness center/spa/playground for kids with guardian for hire), lovely rooms furnished lavishly for your pleasure (with garden, ocean or beach view), savory food plus drinks in their 4 smashing restaurants, and so on… Crimson Resort and Spa, Mactan, is so remarkable, there’s no where you’d rather be for a holiday, wedding, and/or corporate meeting, but here! #3 - Plantation Bay Resort and Spa: There are all kinds of super-duper activities lined up for you at beautiful Plantation Bay Resort and Spa – which can be found in Marigondon, Lapu Lapu. Come and feel so alive with their Island Adventure, Coral Reef Encounter, Coastline Cruise, Whale Shark Adventure, etc. Additionally, give in to your palate’s delight with all the dainty cuisine in their 24/7 café and restaurant called Kilimanjaro Café, together with 4 other fascinating restaurants here. Other splendorous reasons to stay are their comfortable and spacious rooms all adjacent to the swimming pools and saltwater lagoons which are open for unlimited use. These and other clever amenities can be yours even just for a weekend over at Plantation Bay Resort and Spa, where you can absolutely have the time of your life! #4 - Moevenpick Hotel Mactan Island Cebu: As soon as you reach Moevenpick Hotel Mactan Island Cebu, located at Punta Engano, Lapu Lapu, you could hardly speak as you behold this phenomenal resort with beachfront view! You just can’t help but appreciate their private, white sand beach, free WiFi in rooms, water sports, etc. every step of the way. Besides, get a thrill out of all the tasty cuisine in The Sails buffet restaurant, whoop it up in their socialization place called Ibiza Beach Club, and get a soothing massage at Spa del Mar after all your day’s priceless activities with your officemates, family or friends. Therefore, visit Moevenpick Hotel Mactan Island Cebu – your distinctive getaway that will surely make your day! #5 - Bluewater Maribago Beach Resort: Had it not been for the hustle and bustle of city living, you would have opted to stay forever at Bluewater Maribago Beach Resort – a tropical paradise over at Buyong Maribago, Lapu Lapu. But since you can be here even just for a holiday, you might as well revel to the utmost in their top activities like swimming whether at their heavenly beach, and/or lagoon-like freshwater pools; besides jet skiing, scuba diving, snorkeling as well as island hopping. There’s also fine dining at Allegro Restaurant where you’ll satisfy your craving for Filipino and international cuisines no doubt. Have a whale of a time with Bluewater Maribago Beach Resort’s other grand facilities in addition to their outstanding accommodation as soon as you possibly can. If done, then you’re the man! 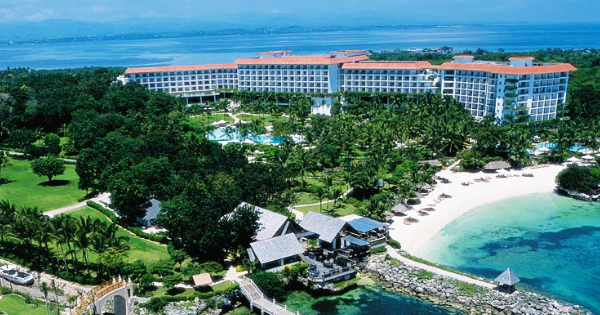 #6 - JPark Island Resort & Waterpark, Cebu: Need to recharge your batteries? Then, come looking for JPark Island Resort & Waterpark, Cebu - located at M.L Quezon Highway, Barangay Maribago, Lapu Lapu. Come on, now! Don’t be blue, and just get a kick out of JPark Island Resort & Waterpark’s Mactan Island white sand, cool waters, glorious sunshine and clear skies! To top it off, catch up on some sleep in their first-rate villas or other spacious rooms, furnished with tiptop amenities for your comfort and convenience. What is more, dig their terrific themed pools that include Island Pool, Amazon River, Wave Rider, etc. Last but not the least; you can also feast on this incredible resort’s culinary treats from The Abalone, Olive, Ching Hai, and many more!